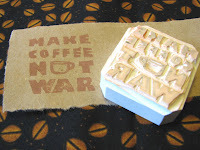 I spend a good chunk of time yesterday making these rubber stamps and listing everything in the Etsy shop. 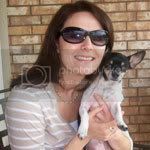 Listing things takes quite a bit of time -- taking photographs, tweaking them in Photoshop, writing the description, writing the listing.... I often wonder how some shops can do so many one-of-a-kind items. The new drawstring bag is also celebrating cupcakes. 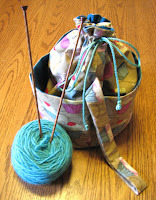 I made one to angel someone in the Starbucks & Yarn Swap -- she loves cupcakes, aqua, pink. So it seemed logical to make another for the shop. It's lovely cotton fabric designed by Martha Neigly and then lined with turquoise linen. It would make a fun handbag or a great knitting bag. 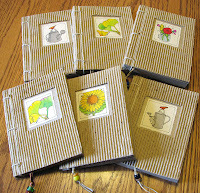 I did these journals years ago for an art fair -- probably one of the last times I did the Ann Arbor Art Fair. I did a whole bunch of them and recently found the ones that were left. Thought I'd put them in the shop and get them out to folks who would use them. So that's what's new in winemakerssister.etsy.com! Great items and great shop! Love the journals!